Vacation is a time to get away from it all - unless you're a geek or a photo hobbyist. For us vacation is when you actually have time to play a bit with the technology that is an important part of your life. Our first thought was to vacation with the Nikon D300, but it's such a sought after camera around the world there was concern it might be a magnet for theft. Since the destination was the laid-back Caribbean Island of Sint Maarten (St. Martin) there also wouldn't be much opportunity to exploit the 8FPS speed that is one of the superb features of the D300. After all, there are only so many Jet Ski freeze shots anyone should have to endure. After our Sigma SD14: Quick Look at a Quirky Wonder review, it seemed like an interesting idea to try to spend a vacation with this unique camera. It's a fact that almost no one would recognize the Sigma brand, and the new ultra-low pricing made the thought of losing the camera or having it stolen not such a big deal. Would the limited low-noise ISO drive us crazy? Would the leisurely write times fit "island time" or drive us to the brink of "camera-cide"? Would we find the Foveon sensor capabilities interesting enough to try to take advantage of its "slide-film-like" color? These are all questions we set out to answer. Regardless of what problems the camera may or may not have, I've been wondering for a while now whether Sigma is losing money on the model. We all see other camera manufacturers lower prices on models that have been replaced at their previous level in the lineup, and usually, those cameras disappear after a few months at the low end. 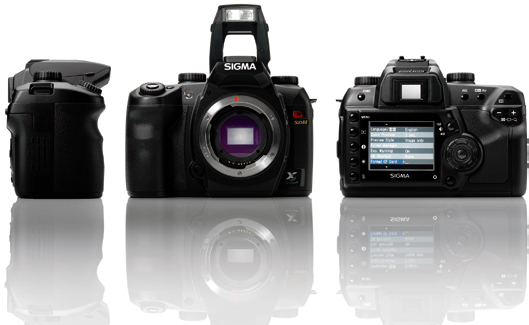 But Sigma has lowered the price far more than has anyone else, and for a low selling model. The actual selling price of the camera is much less than 50% of what it was originally. What's happening here? Is there some idea of a new model with, after so much time, a new sensor? A Foveon sensor with an 8, 8, 8 sensor could compete again at higher price levels, esp. if they fix their color problems, and have a more competitive body. I wouldn't be surprised if Sigma was losing money at the price that many retailers are currently selling the SD14 but the camera market moves so quickly unless you are one of the big manufacturers the focus will shift to latest and greatest release. Where Sigma do make money is the lens mount. The camera only accepts Sigma mount lenses unless you are either willing to to do a mount conversion or use an adapter. Some users are willing to go to so much trouble in order to have extra lenses at their disposal but most users will accept that they are restricted to Sigma only lenses and if each Sigma SD14 owner invests in only two lenses there must still be a reasonable profit margin there. The Sigma lenses are still great buys compared to the competition. Cameta Camera, who seems to have a special relationship with Sigma in terms of extensive Sigma offerings and terrific pricing, is selling the 18-200mm OS lens for $329. This is about the same price most ask for the non-OS version. The Nikon 18-200mm VR is between $600 and $700 and Canon really doesn't have a comparable lens. In fact the Sigma mount is cheaper than either the Canon or Nikon versions for this same Sigma lens - at least at Cameta. After reading your previous article on the SD14 I wouldn't have been surprised if that would have been the end of your writings on this camera. Nice to see that I was wrong. It would probably have been an easy decision to take the D300 with you on holiday and possibly would have resulted in more clicks from interested Nikon users but I doubt anything would have been learned that has not already been said before so the decision to try out the SD14 was not only an interesting one but should be applauded too. It would be nice if other reviewers did more follow up reviews of the equipment of smaller manufacturers in a range of real life situations beyond the initial review. If this approach was taken more often there could be a wealth of information available that is currently lacking for some equipment that don't always do so well in the one size fits all sort of review that is so often implemented. Regarding the review itself, again very fair and informative. Personally although there are times I like accurate colours from my photographic equipment, there are other times where I just want pleasing colours. To me photography is like art, its not always necessary to get accuracy but it is essential to get something that pleases. In my own experience I've found the better the lens the more pleasing the result can be from the foveon sensor. The SD14 is a camera that does demand some thinking to be done and does take a little time to learn how it likes to be handled, which isn't always the way you'd expect if you have used other cameras before. But the more experience you have in using it the more the camera rewards you with nice results. Something I'm sure you found out when using the laptop to assess your shots at the end of the day. Like you I prefer to travel light, the lighter the better, but if someone had just bought the SD14 and they were more used to other cameras and were considering using this camera in a similar situation I would if they had a laptop available encourage them to take it with them. Purely because this is a beast that rewards experience of the camera and it would be a shame to miss a few shots through lack of info. I wouldn't encourage post processing of every shot - enjoy your holiday doing vacation type things and do the bulk of your processing at home - but taking the time to look at a few shots where things went right and where things went wrong could be useful later on in the week. It could result in getting some real keepers that might otherwise be unfortunate missed opportunities. I agree it is a simple camera to use but a little extra knowledge and experience does go a long way with this tool. I say all of this as someone who a few years ago took a new camera on holiday, which was not a Sigma, and as someone who has had an SD14 for a few months. I'm sure for many people a holiday is often as good an excuse as any to buy a camera, it certainly was for me in that occasion but in hindsight I found that it wasn't the best place to learn how the camera in question likes to be operated. At the time I got a lot of nice shots of some memorable moments but I could perhaps have got more still had I been more familiar with the camera. With more experience of the SD14 I would think the laptop could be left at home and would be my preference in travelling light. I would much rather take an extra good quality lens to allow added creativity. I noticed a number of images with ISO 400, that really could have been ISO 100 images with that lens - with shutter speeds up around 1/400 or 1/500 you could easy have brought down the ISO back to 100, and retained a lot more detail as a result. I was one of the pro photographers in the Popular Photography, December Sigma Advertisement for the SD14. I've been using Sigma DSLRs from the very humble beginning of the SD9 to the current SD14. There is alot of controversy concerning the low light performance of the SD14 and also higher iso 400 and up noise issue. I've found that other DSLR systems use in camera noise programs that produce soft, but less noisey images right out of the camera even when shooting raw. They supposedly raw images produced by most bayer sensored cameras are in fact heavily edited images prior downloading them to the computer. The SD14 doesn't do any serious noise reduction in the image coming out of the camera. In fact, the SPP 3.2 and 2.5 versions of the Sigmas Software barely addreses noise after the fact. So how does someone who wants to shoot at higher isos with the SD14 deal with this? Imagon's Noiseware program is the best solution I've found to date. It is superb. If you sent me the raw images of the pictures you posted shot at iso 800, I'm sure that noiseware would take care of the noise in these images easily, salavaging them for you. I found this out after a helicopter shoot of the Hawaiian Islands with the SD14. We couldn't remove the doors off the helicopter, so I had to shoot through the canopy which lowered the light about 2 Fstops and also needed to use a polarizing filter which further lowered the light. It was a disaster in the making, forcing me to shoot at iso 800. But after spending all this money on the helicopter, I was going to try to get my monie's worth. When I got back to Florida and post processed the images, I thought the shoot was a complete bust, until a pro buddy of mine suggested Noiseware from Imagon. Even Noise Ninja couldn't clean up those images. Noiseware saved my shoot and I was able to save the images and use them in my latest gallery exhibition of my photography at www.pmgallery.info. I think your article was fair and well balanced. The camera does extremly well in low light photogaphy, but you must meter on the darkest part of the image to get lower noise images. Too many just set the camera on automatic and do not use the center meter to improve the low light performance of the camera. That is the biggest difference between the SD14 and other cameras. It is the thinking man's camera quoting Australian Editor Peter Bourroughs in his review of the camera in photo Pro magazine. The SD14 is an incredibly powerful tool and can produce results unlike any other camera on the market. How can I make such a statement? I've been invited by a media company's to test shoot with the Nikon D3, recently and had the opportunity to see just how it compares with the SD14 and for anything but event photography or something requiring handheld low light photography, the SD14 is a top performer and my prefered choice over any other brand I"ve tested so far. Now that the price is so low, it is one of the best values in the market providing the highest image quality for the lowest cost. Period. DISCLOSURE: I do not work for Sigma USA nor do have I ever received any monetary compensation from Sigma USA. I use the SD14 for my professional digital work and the opinions are my own based on my experience using the SD14. I have experimented with Noise Reduction software in the past - with very mixed results. However, after experimenting with Gary Mercer's recommendation of Imagenomic NOISEWARE to reduce noise in high ISO SD14 images I confess I am blown away at the results. Not only are the ISO 800 images dramatically improved, so are ISO 1600 shots in the original review. Even ISO 400 and the Macro images in the SD14 review are improved and stunning. All of this was just with the Free standalone Community Edition of the software. I certainly intend to do more testing and a follow up article. I also found Noiseware dramatically improved Pentax K20D noise. Even ISO 6400 images became very usable. The E3 also benifitted at highest ISOs. Other camera high ISO images saw some small improvements but nothing like the SD14 and K20D. Sincere thanks for your interesting insights and links on high ISO noise with the Foveon sensor in the SD14. I will certainly look into Imagon's Noiseware as a tool for high ISO shooting with the SD14. Your comments are sincerely appreciated. You can reach me by email at wesley.fink@anandtech.com. I will be happy to send you the original raw images of the ISO 800 series to see what Noiseware can do - just tell me where to email them.